Stoopid American offers one view from the States on European football, particularly the English Premier League. Although football is the only genuinely global sport, many of the trends in the business and reception of the sport have clearly been pioneered in the United States. As such, an American perspective has something to add to the conversation. I will highlight areas in which American and British attitudes towards and experience of sports differ. I am particularly interested in how fantasy sports and the statistical revolution connected to them relate to football. European resistance to the business of sports is another area where an American perspective is particularly fruitful. Along the way, I will also offer more general reflections on the game and analysis of specific teams and games. When not thinking about football, this stoopid American teaches British literature (the older stuff) at a small liberal arts college in the midwest. 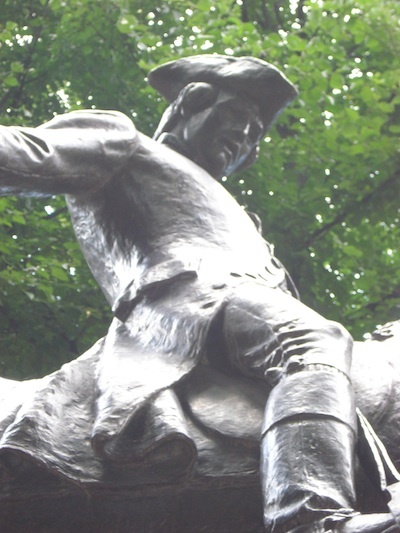 A statue of Paul Revere, the pacy libero who organized the Continental XIII’s defense in their historic victory over the much-favored English Red Coats in the 1776 Articles of Confederation Cup.